It is, but I think they’re crazy not to have put Imaginary Diseases on there. I saw them open with it in Boston – it sounded unbelievable! 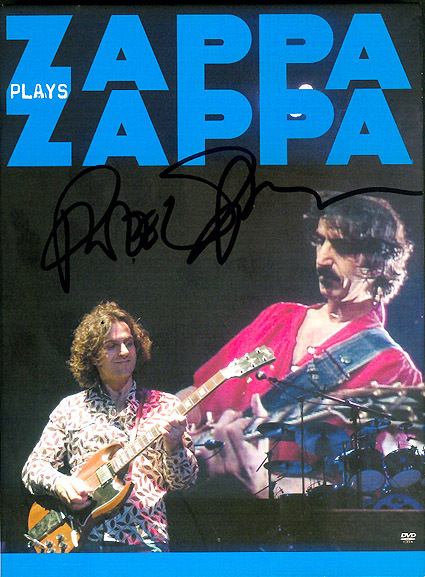 A Zappa fan’s dream come true songwise, but when are they gonna release it in the stores?! At first I was no amazed, I dont know why, but listennig to it again: its good! Fine orchestration, Vai’s solos… great stuff. Some great moments, allright. Two more things: between the bonuses there’s Pygmy Tw. and an interview, with nothing really new. But: a normal CD would be fine (maybe with Im. Diseases?). I’d listen to it a lot, I think. Did you notice that nr. 11 is missing form disc one?… Hehe. Maybe bacause “father o’blivion” is splitted in two pieces? Is the bonus Pygmy Twylyte audio only? And is the arrangement as astounishing as the performance this year? I’m not a Vai fan, but that song alone (as played this year) is worth owning the DVD. Jeroen: full blown video — and a great arrangement if you ask me. One more time!! WHEN is it available in Retail Stores??? I made a request of ZFT to publish information about the DVD on their website. Let’s see if they do. It wasn’t available at the NYC show tonight, and the merch people knew nothing about it. And it was the first night of the US leg of the tour, so they should not have been out of it. I did pick up Zappa\Wazoo though! They were selling it in PAL (European format) in Wallingford, Ct. tonight… What is the deal? It is done, where is it in the US????? When’s in gonna be in the UK stores? 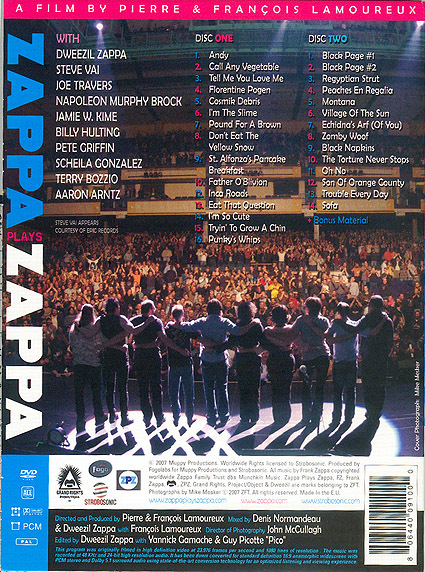 You are reading ZPZ DVD: Sneak Preview which was posted on Tuesday, October 9th, 2007 at 2:21 pm by Barry's Imaginary Publisher. This entry is filed under Zappa News, Zappa Plays Zappa.